I’ve said it many times: Daggerfall Tools for Unity is a platform. Besides helping to recreate the game, DFTFU can be used to remaster and re-imagine Daggerfall, or create whole new games in a similar style. Merging Daggerfall’s content with a powerful engine like Unity provides limitless potential. Nothing shows off this potential more than mods created over the last several weeks by Nystul, LypyL, and Uncanny_Valley. These range from graphical enhancements and world improvements to silly fun like turning Daggerfall into a flight simulator. I’m so very proud to show off their hard work in the below video and to provide a playable demo for you to experience their work first-hand. Linux build will be ready soon. See below for complete list. 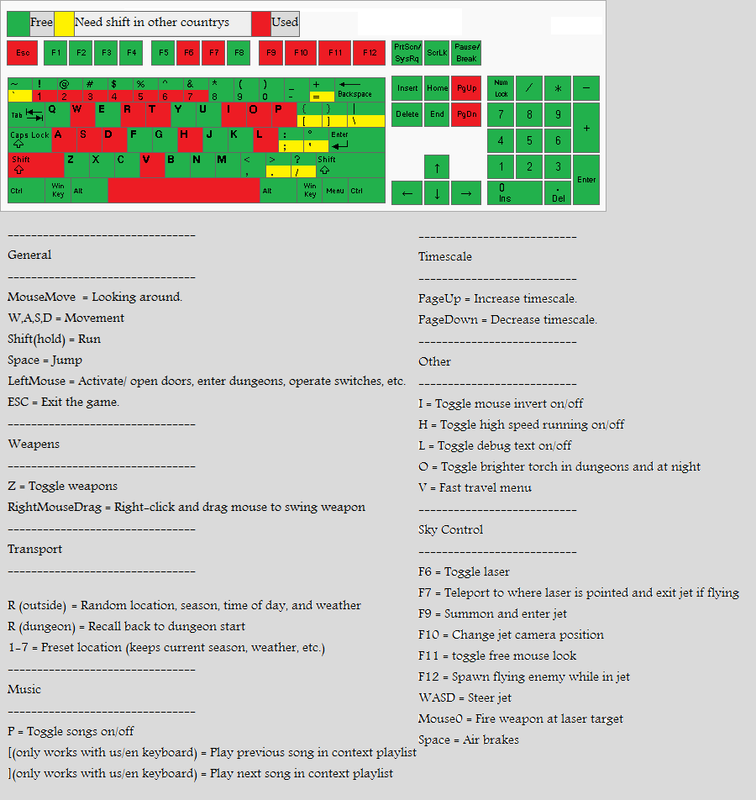 There is also a handy key reference created by Daschluba on the forums (click for full size). Left Mouse Activate: open doors, enter dungeons, operate switches, etc. Hit V key to open/close travel menu. You can either set your coordinates directly using the sliders, or select a Region & Location using the Location menu and hit the Set Coordinates button. Once You’re ready to travel, just hit the GO button. Red marker indicates your current location, the white shows where you will travel to. It’s very rare, but it’s possible to fall through the ground after traveling. If it happens (and you don’t have another solution, like the editor), just fast travel again somewhere to fix it. Posted in Daggerfall Tools for Unity, Demo, Featured, Movie.